Better and more advanced than previous iterations, the 2019 Volkswagen Jetta takes the economy car segment to the next level. The cabin of the Jetta has been enlarged to fit passengers more comfortably, and the engine has been updated to be more fuel-efficient. Not to mention, enhanced technology features in the 2019 Jetta allow riders to be more connected, entertained, and safe on the road. If you would like to get a better idea of what to expect from the 2019 Volkswagen Jetta before getting behind the wheel right here in West Covina, CA, you have come to the right place. Feel free to check out the information below to help determine whether the 2019 Jetta is the right fit for you. Test Drive the 2019 Jetta in City of Industry, CA! In addition to a redesigned exterior, additional interior space, and a more efficient engine, the 2019 Volkswagen Jetta has so much to offer everyday drivers. Shoppers can choose from five different trims as well as a wide variety of standard and available elements, such as LED headlights and taillights, a panoramic sunroof, 10-color customizable ambient lighting, V-Tex leatherette seats, heated and ventilated front seats, and so much more. 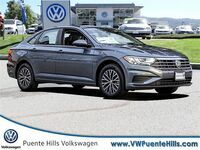 If you would like to get a better idea of what to expect from the 2019 Volkswagen Jetta, we invite you to get in touch with our team at Puente Hills Volkswagen. Feel free to schedule a test drive to reserve a time to get up close and personal with the new Jetta.